I had such a nice weekend: it finally snowed so I was home most of the time hanging out with my family, and had a chance to clean and organize a bunch of areas in my house that desperately needed attention. I also got to cook a couple of delicious new dishes. 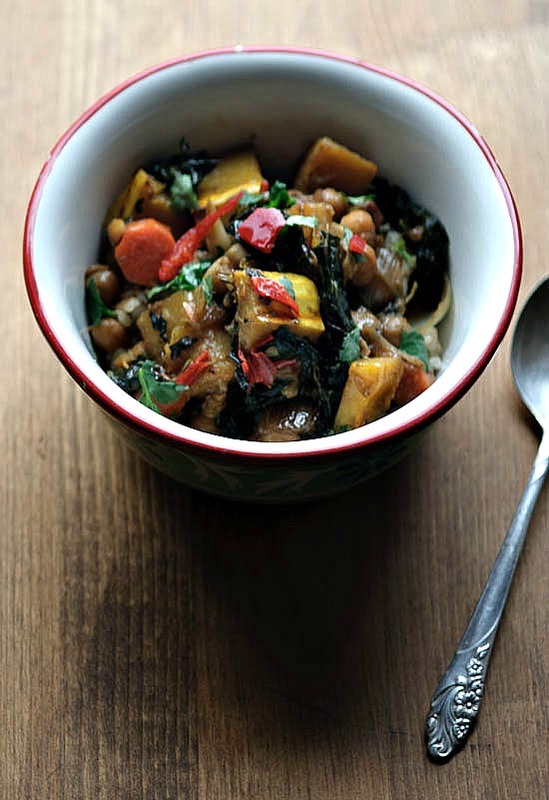 These wonderful Chickpeas with Delicata Squash, Kale, and Coconut Milk were adapted from the recipe for Chickpeas with Pumpkin, Lemongrass and Cilantro, which can be found in the lovely book Tender: A Cook and His Vegetable Patch by Nigel Slater. I think it’s an exquisite vegan meal: not quite a soup or stew, since there’s only one cup of coconut milk and a smaller amount of water here (and the liquids mostly cook off). The chickpeas and vegetables have a silky texture and wonderful coconut flavor, spicy from the fresh chiles but not too spicy, and not at all complicated, since I did not raid my spice rack to make this dish like I sometimes do. If you prefer a “soupier” meal, you can certainly double the amount of the coconut milk and add more water; if you prefer a more complex flavor profile, herbs/spices that would be nice here include lemongrass, kaffir lime leaves, ground cardamon, coriander, and tumeric. I served this over short grain brown rice, but I think quinoa would be great, too. The quick chile sauce is optional, but highly recommended: it really makes the dish shine. Please don’t skip the fresh lime juice, though- you’ll love how its acidity balances out the sweet, rich coconut milk. Adapted from Tender: A Cook and His Vegetable Patch by Nigel Slater. This recipe feels so “you”, lovely natural ingredients, special touches of lovely herbs and spices – and vegetarian to boot. Thanks, Winnie! Just the kind of meal I adore whipping up this time of year! I’m in love with Nigel’s book. It’s just too amazing to be shelved among my cookbooks. Instead, it sits on the table next to the couch. What a wonderful meal! This recipe looks outstanding. Love the kale and coconut milk in there, sounds awesome! Save some room for MY WHOLE FACE. sounds like a fantastic anytime meal! delicata is my favorite of the winter squashes – i’m an impatient cook so i don’t even peel it, love that the skin is so tender. lovely, colorful and conforting, plus it is seasonal, which you know I love! On another note, I found and bought some organic cold pressed flaxseed oil. Looking forward to your next post on fats usage in the kitchen! I keep seeing such great recipes inspired by “Tender”, I think I need to go get me a copy. This looks lovely. I love all things coconut milk – this sounds delicious. Winnie, you are killing me! I adore all of these ingredients! Can’t wait to try it! This is so pretty – I knew before clicking the link the photos would be lovely. What a wonderfully sumptuous yet healthy recipe. I absolutely love chickpeas and coconut milk so this recipe is a win-win for me. Thanks for sharing! I will be making this sometime soon! Thanks for the heads up on Nigel Slater’s book – looks awesome & I just ordered it!! Beautiful combination of flavors! I’ve been really enjoying all things coconut lately. This is really very useful book. There are lots of recipes to be learnt that can be found in the book. I am going to buy it soon. Thank for letting me know about this book. Yum! 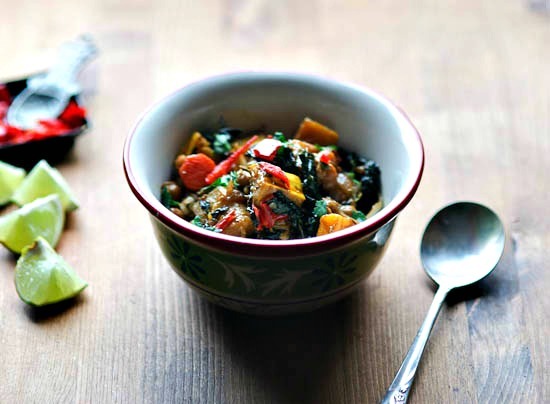 I love kale, chickpeas, coconut milk – this is perfection in a bowl for me! Thanks for sharing this recipe! I love colorful meals – they mean healthy and delicious to me! This is so beautiful, and looks like a delicious recipe. I cannot wait to try it! Made this last night for dinner (but with butternut…It’s what I could find!) and LOVED it! Thank you so much! This looks delicious, and I will be making it this week! I have only one problem with the recipe (and I will fix it myself when making it), and that is how come you are calling for everything fresh, but the chickpeas are canned? It is proved by large researches, that cancer has a very strong connection to not only processed foods that contain all sorts of ingredients that should not be in them, but also to caned foods in general. Even if those foods do not contain any preserves or whatever els that might be found in some canned brands. Instead – soak dried beans/chickpeas for 8 – 24 hours. Then cook them in a slow cooker, in a regular pot or in a pressure pot. Time will be different between the different cooking options. You can make big batches and freeze in portions – with or without liquid. I’d love to make this during the long weekend! Bought a delicata squash yesterday and am dying to dig in. For the coconut milk here, is it the kind in the can or the kind that you sub for cow’s milk? This dish was wonderful! I made it this morning for my book club annual holiday potluck lunch. While it was one of many dishes as part of a massive buffet, there was only a spoonful left at the end of the gathering! The chili sauce and lime were flavorful additions.